Try as we might, we really have little control over what will happen to our possessions, even our bodies, after we die. Yes, we can draw up legal documents, we can express our wishes to family members and more; however, there are no guarantees when it comes to these matters. The best we can do is prepare, plan and communicate now. When it comes to years of genealogy research and material that you have accumulated, what plans have you made to ensure that this legacy does not die with you? 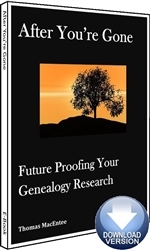 In After You’re Gone: Future Proofing Your Genealogy Research, you will find valuable advice on creating a realistic plan to get your “genealogy affairs” in order. Make sure that the next generation of researchers can benefit from your years of hard work and following your passion. I hope you enjoy After You’re Gone: Future Proofing Your Genealogy Research and remember to take action NOW when it comes to making sure your years of genealogy research don’t go to waste.